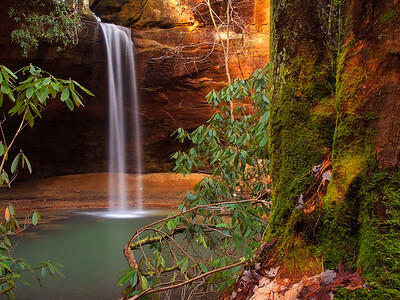 You wouldn't know it, but Kentucky is loaded with waterfalls and this photo gallery is packed with a bunch of them! Anglin Falls John B. Stephenson Memorial Forest State Nature Preserve Berea, Kentucky The first time I visited Anglin Falls was in the Fall of 2008, I didn't know much about shooting waterfalls then, but it didn't matter as the falls was barely a trickle, that was my first lesson in watching the rainfall amounts to get a good idea when a hike to a waterfall is worth it. As luck would have it the next time I would visit the falls was this past Saturday. Over the 5 1/2 years I saw many photographs of the falls with a good flow and eventually it would become a bucket list goal to visit the falls after a good rain. After a successful meeting with the Kentucky Artisan Center in Berea my good friend Chris Morris and I headed out to visit Flat Lick, McCammon and Anglin Falls. The forecast the night before called for a mostly cloudy day, but as luck would have it, it rained all day. We saved Anglin for last and boy was it worth it. 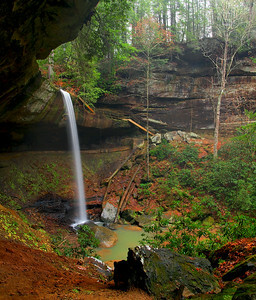 In my opinion the falls it one of Kentucky's most beautiful, a towering 70 ft gusher, with enough rain. A great end to a fantastic day. 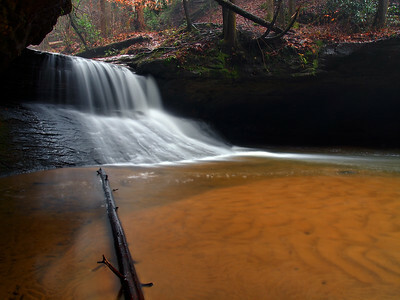 Anglin Falls John B. Stephenson Memorial Forest State Nature Preserve Berea, Kentucky As a bit of respite from the previous crazy week myself and my good friend Christopher Morris hit Flat Lick and McCammon Falls in Grey Hawk, Kentucky and then went to Anglin Falls near Berea. To our surprise the weather man got it waaaaay wrong and several inches of rain had dumped during our trip. 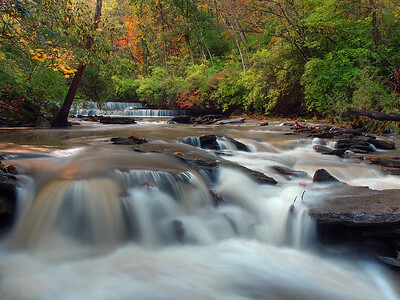 I'll be the first to admit I hate shooting in the rain, but the hassle was well worth it when we visited Anglin Falls. 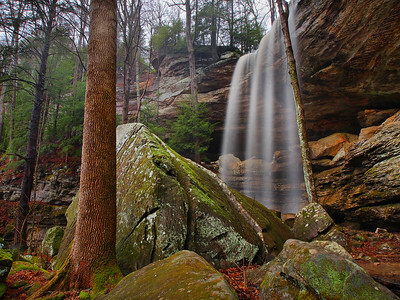 After a good soaking this towering 70 ft. waterfall is one of the most beautiful in the state, then after it splashes down on a slab of rock it falls another 100 + ft in the form of small cascades and drops as it makes it's way around and across a slope of boulders. 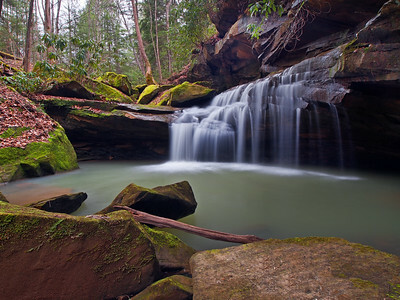 I felt more like I was visiting a scene in the Smoky Mountains, that a small stream on a Kentucky mountain side, as moss covered the rocks the size of cars and towering old growth hemlocks dotted the hillside. Truly a place of beauty, and well worth the wait to visit this gorgeous spectacle. Bark Camp Creek Cascades Bark Camp Creek Daniel Boone National Forest Kentucky This past New Years Weekend I headed down to Southern Kentucky near Cumberland Falls to grab some shots for a few last minute touches on a project that needed to be turned in yesterday. 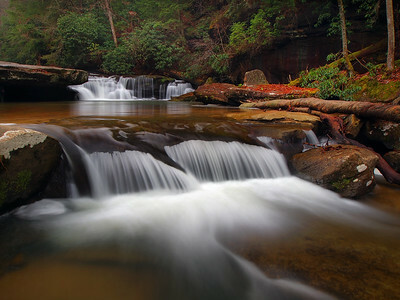 My goal was to visit a few falls I'd not visited before and to revisit a couple I'd not gotten photographs of that I was satisfied with, so our first visit was to the Bark Camp Creek Cascades in the Daniel Boone National Forest, a place I had never been to. 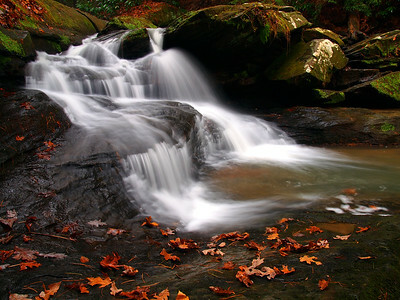 Located a short distance upstream from where the creek meets the Cumberland River, the water drops over several shelves before passing through a boulder strewn watershed and into the river. Just as the creek meets the boulders the remnants of an old bridge remains that was once part of the The Sheltowee Trace National Trail. I was really glad we chose to arrive early Saturday as that night it was forecasted to rain, and rain heavily, so we felt visiting the cascades with lower waterflow would be best, and boy was it. With perfect weather conditions as well as waterflow we couldn't have asked for any better and a fairly comfortable 1.4 mile round trip hike really topped it off! Bark Camp Creek Cascades Bark Camp Creek Daniel Boone National Forest Kentucky One of the Kentucky waterfalls I wasn't sure if I was going to ever visit were the Bark Camp Creek Cascades in the London District of The Daniel Boone National Forest, not only because of the 2.6 mile moderate one way hike but also because what I had seen of them I didn't think that hike would be worth it. Well, thank goodness for shortcuts, as it was revealed there was a 0.6 mile trail to the falls from a nearby forest road and they turned out to be a lot cooler than I ever imagined. 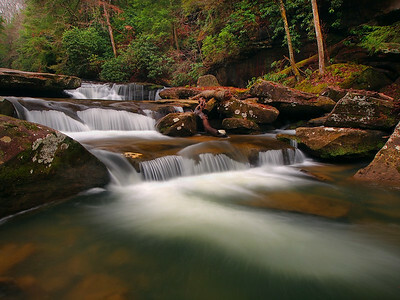 Located a short distance upstream from where Bark Camp Creek meets the Cumberland River the cascades are 5 or so tiers of short drops before passing through a boulder strewn creekbed. I just loved this little section of the falls. They are definitely worthy of a return trip. 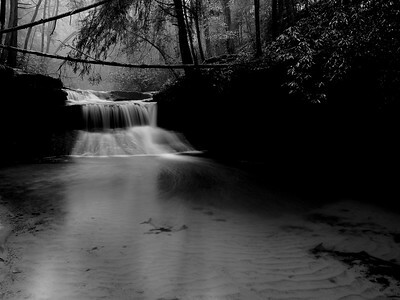 Lower Waterfall Big Bloody Creek Wolfe County Kentucky ears ago myself and good friend Christopher Morris drove past this falls and saw it through the trees, but because you had to access it by walking by a residence to reach it we decided not to check it out. Fast forward 4 years later. The residence is no longer there and after hearing the landowner didn't mind folks visiting the falls as long as there was no damage I couldn't resist visiting this beauty. Actually it's two waterfalls about 100 ft from one another. Being so close to a residence, I was amazed there wasn't an easier way down, although it wasn't that hard, just steep and slippery. I didn't even pay any attention to the upper falls, I bee-lined for the lower. Seeing it from the road had me focused on what I knew was a beauty. Sure enough it was. I made two descents here. The first I decided to slide down to the right of a large boulder to capture the falls from far away, after shooting there I made my way back up where after some deep thought I decided to slide down the left of the boulder, which looked like it had a much trickier ascent. After deciding I'll deal with coming up later I went ahead and slid down. Boy was I glad I did! 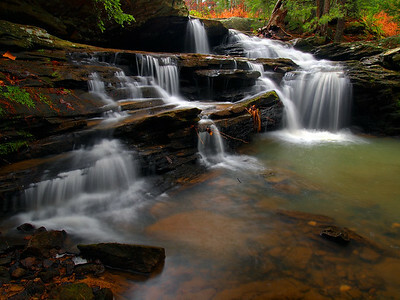 I loved this falls! There were so many comps to shoot it from, this being my favorite! After I finished up I began that return trip up along the boulder and it was as challenging as I had expected as it required me to pull myself up in several places. Talk about upper body soreness the next day! But it was worth it! Oh, and that Upper Falls? Could be one of the ugliest falls I've tried to shoot and I have a feeling that none of you will ever see a photo of it. Lower Waterfall Big Bloody Creek Wolfe County Kentucky Another photo of a privately owned waterfall in Wolfe County, Kentucky! I was really glad that access was allowed to this beauty as I spent quite a while here enjoying taking in this waterfall. The fun part about here, was getting out. 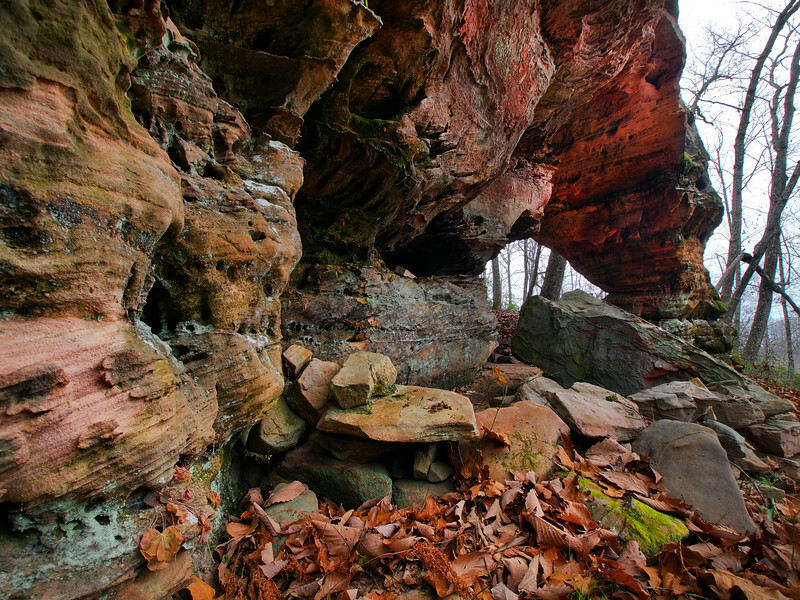 A thin layer of soft wet dirt covering a massive rock made for a challenge. My whole upper body was sore after the scramble and pulling myself out of the creek. I love aging. It was all worth it though! Broke Leg Falls Menifee County Park Wellington, Kentucky Narrative created prior to tornado damage. 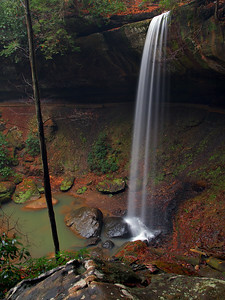 This is the first of a series of 4 waterfalls at this little known park about 15 miles outside Red River Gorge. Probably the most interesting thing about this 8 ft. tall falls is that it rests right along side an open field. The first time I was here I couldn't do anything with this falls as the light was just too hard in the background and was creating halo's in the photographs. Of the 3 smaller upper falls at Broke Leg, this is the most interesting, however the final falls is a tall 60 ft. beauty that is the real star. Broke Leg Falls #3 Menifee County Park Wellington, Kentucky Narrative created prior to tornado damage. 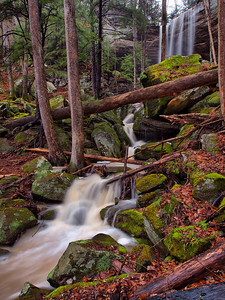 This is the first falls you'll see if you head down the short trail to Broke Leg Falls #4 and in my opinion a difficult waterfall compositionally to capture. What makes this 6 foot falls difficult to shoot is the angle the falls dog legs around the rock in a very short distance. Some perspectives hide the upper part of the falls. I've shot this falls on two occasions, several times and this is the only shot that I feel is worth posting, but I also was in a little bit of a rush both times so next time I'm here I'm going to try some new perspectives and take my time. 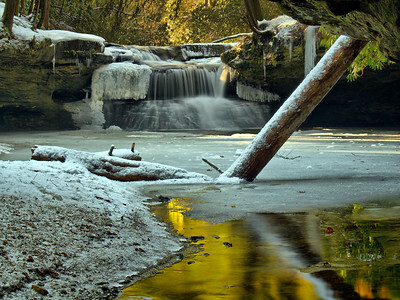 Broke Leg Falls #4 Broke Leg Creek Broke Leg Falls Menifee County Park Kentucky I was looking forward to returning to see an old friend, knowing several inches of rain and snow had fallen over the last few days. Devastated in the great tornado outbreak of March 2nd 2012 the entire landscape that surrounded the 4 Broke Leg Falls in this small park was completely raked by an F-4 tornado. After passing over the falls the tornado continued down the gorge, not only destroying everything in the gorge but also everything above the gorge's 200 ft. sheer cliff walls. It is truly a sight to behold as you bare witness of the effects of awesome power of nature. 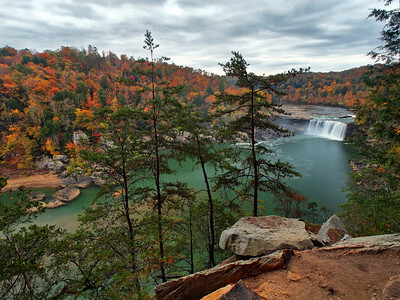 When I first visited this falls a little over 2 years ago it quickly found a place in my heart as one of the most beautiful and scenic in the state of Kentucky. At 60 ft. tall, at my last visit to the falls prior to the damage I opted against shooting the falls from inside the gorge and figured I would wait till the next time I would stop by. Just goes to show you that you shouldn't put off what you can do today for now it is far too unsafe and difficult to make the trek at creek level as there is so much unsettled deadfall. It will take many years for this area to recover, longer than my remaining lifetime. I'm just glad that the park is rebuilt, a new bridge at the top of the creek, new handrails, the deadfall is cut away from the trail and some of the upper falls and they've put a new picnic area that you can see near the top center of the photograph. Broke Leg Falls #4 Broke Leg Creek Menifee County Wellington, Kentucky I was in the neighborhood last October and I just couldn't resist stopping by what was at one time one of my favorite waterfalls, the towering 60 ft. tall Broke Leg Falls in Menifee County, Kentucky. Back in Spring of 2012 during a massive tornado outbreak the falls and the gorge took a direct hit competely raking the surrounding landscape. 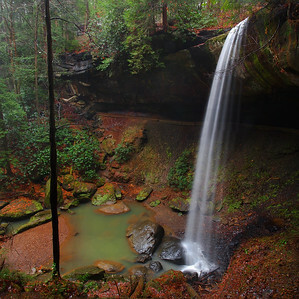 As we drove US 421 on our way to Red River Gorge it was quite apparent that the leaves were changing in the higher elevations and since the falls was just a little under 9 miles out of the way I just had to satisfy my curiosity. Boy, was I glad I did. One of the few remaining trees, which happens to be right in front of the falls, was in full color and although you can see there was still damage, I thought it was a pretty scene, a scene that at one time I thought would never want to shoot again. Broke Leg Falls #4 Menifee County Park Wellington, Kentucky Shot before the tornado. 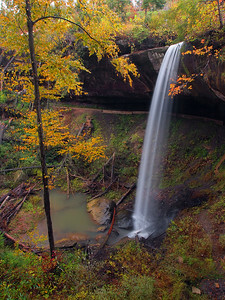 A view of the 60 ft. tall Broke Leg Falls from the right. I thought the falls namesake is because of how rugged the area is, in fact it is named that because of the path the creek has created between the uppermost falls and the this falls. Nonetheless, you could easily hurt yourself. Broke Leg Falls #4 Menifee County Park Wellington, Kentucky Another shot of the towering 60 ft tall waterfall before the tornado. Broke Leg Falls #4 Menifee County Park Wellington, Kentucky The interesting story behind this particular adventure...We all descended the steps you can see across the gorge, and set up and started taking pictures. Good friend Jason Haley set up on a flat platform under the steps. After a few minutes of shooting I went over to talk to him, as we were talking his 40d and tripod just launched off the platform, landing camera first about 20 ft. down in the gorge. We were both amazed, his head was turned to me and he didn't see it happen, but I did and he hadn't touched it, and there was no wind either. It was bizarre. The 40d was destroyed as was the wide angle lens that broke off and left the mount in the camera, the tripod came out fine. Later I would joke it was the ghost of Broke Leg Falls, because I have no other way to explain what happened. Broke Leg Falls Menifee County Park Wellington, Kentucky Another perspective of the towering 60 ft tall waterfall before the tornado outbreak of March 2013. Waterfall On Copperas Creek Copperas Creek Red River Gorge Geological Area Daniel Boone National Forest Kentucky I've come to the conclusion that the unofficial trail to Copperas Creek Falls in Kentucky's Red River Gorge is one of my favorite Kentucky hikes. This was the second time I'd made the 5 mile in and out and I'm going to have to admit, it is a real workout. Although there's not much elevation change, it requires at least 10 creek crossings, lots of creek wading, 20 + tree straddlings, 1000's of fussy rhododendrons, and quite a few wrong turns. This trail makes you think. As you weave and bob through an almost primeval forest, an emerald moss covers much of the woods and the whole time nature in some way tries to hold you back from going any further. The rhododendrons tangle into you, a grove of downed trees force a substantial detour, a thorn bush grabs onto your jacket, it is truly rugged Kentucky. However, in the end there is a payoff and what a payoff it is. 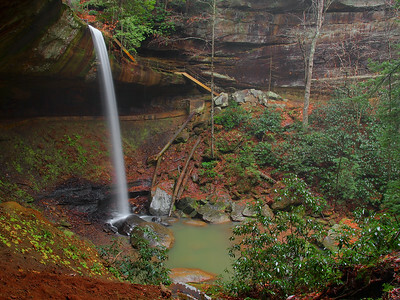 A 40 ft. waterfall drops into an emerald splashpool that is surrounded by a grove of rhodys and behind is a beach of sandstone pebbles. 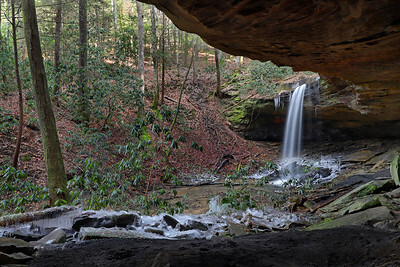 This is just one reason I love Red River Gorge. Today I may be sore in places that I am never sore after a hike, but that's OK, because it was well worth it. Creation Falls Rockbridge Fork Clifty Wilderness Daniel Boone National Forest Kentucky Located in the Clifty Wilderness in the Daniel Boone National Forest near the Red River Gorge, this was the heaviest flow I've ever seen at Creation Falls in all the times I have been here to view it. 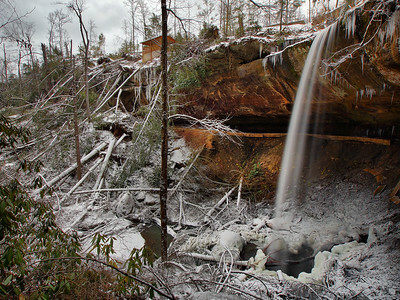 Even though it was 50 degrees on top of the mountain, down at in the bottoms it was still near freezing, making the hiking and viewing around the falls treacherous as previous hikers had trampled the snow down making it a thick sheet of ice. I didn't even go to the viewing area because of how hazardous it was but thanks to my friend Nathan who was exploring all around found a place that was safe to shoot and was a cool perspective too. Little did I realize when he told me about it that I was going to see one of the most beautiful waterfall scenes I had ever beheld. 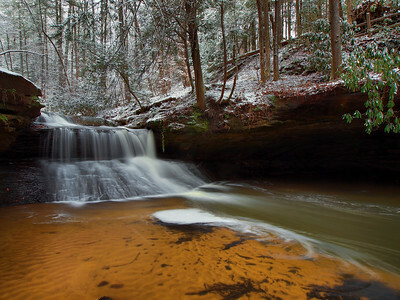 Creation Falls Rockbridge Fork Clifty Wilderness Daniel Boone National Forest Kentucky Normally cold doesn't bother me but for some reason when good friend Christopher Morris and I arrived at Creation Falls in the Clifty Wilderness near Red River Gorge in Kentucky it was darn cold. The occasional breeze really bit into the bare hands but I put it out of my mind and soaked in the beauty of a fresh snow surrounding the gorgeous 10 ft. tall waterfall, one of my favorite places to visit in The Gorge. Waterfall On The Tributary Of Dry Creek Erlanger, Kentucky One of my more recent surprises this Autumn was finding out about this lovely little double falls in Erlanger, Kentucky just a few miles from my house. 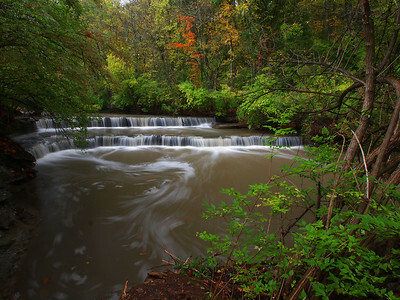 Located in the shadow of I-275, I was quite surprised at the beauty of the creek after it passes through a massive culvert far under the interstate, which interestingly on the other side has three more waterfalls. I had hoped to stop by here again before all the color left the trees but I've been so busy I wasn't able to make a return trip. Oh, well, hopefully next year! Have a great weekend! ears ago myself and good friend Christopher Morris drove past this falls and saw it through the trees, but because you had to access it by walking by a residence to reach it we decided not to check it out. Fast forward 4 years later. The residence is no longer there and after hearing the landowner didn't mind folks visiting the falls as long as there was no damage I couldn't resist visiting this beauty. Actually it's two waterfalls about 100 ft from one another. Being so close to a residence, I was amazed there wasn't an easier way down, although it wasn't that hard, just steep and slippery. I didn't even pay any attention to the upper falls, I bee-lined for the lower. Seeing it from the road had me focused on what I knew was a beauty. Sure enough it was. I made two descents here. The first I decided to slide down to the right of a large boulder to capture the falls from far away, after shooting there I made my way back up where after some deep thought I decided to slide down the left of the boulder, which looked like it had a much trickier ascent. After deciding I'll deal with coming up later I went ahead and slid down. Boy was I glad I did! 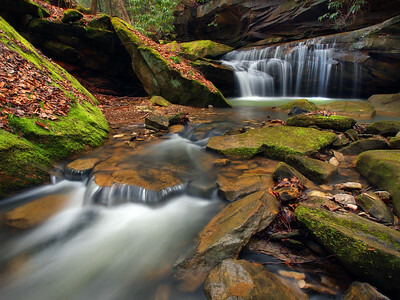 I loved this falls! There were so many comps to shoot it from, this being my favorite! After I finished up I began that return trip up along the boulder and it was as challenging as I had expected as it required me to pull myself up in several places. Talk about upper body soreness the next day! But it was worth it! Oh, and that Upper Falls? Could be one of the ugliest falls I've tried to shoot and I have a feeling that none of you will ever see a photo of it.